"We always hear people say there are no Black people in Vancouver, but there are. I identify as a Black woman. I know there was a larger Black community in Vancouver many years ago, but people have been displaced. I definitely want to reach people who not only are of mixed ethnicity but who also identify as Black." Ryan B. Patrick, "Why Chelene Knight wrote letters to the current occupants of the houses she lived in growing up," CBC Books, March 6, 2018. http://www.cbc.ca/books/why-chelene-knight-wrote-letters-to-the-current-occupants-of-the-houses-she-lived-in-growing-up-1.4533897. In the United States, anyone with even a trace of African American ancestry has been considered black. Even as the twenty-first century opens, a racial hierarchy still prevents people of color, including individuals of mixed race, from enjoying the same privileges as Euro-Americans. In this book, G. Reginald Daniel argues that we are at a cross-roads, with members of a new multiracial movement pointing the way toward equality. Tracing the centuries-long evolution of Eurocentrism, a concept geared to protecting white racial purity and social privilege, Daniel shows how race has been constructed and regulated in the United States. The so-called one-drop rule (i.e., hypodescent) obligated individuals to identify as black or white, in effect erasing mixed-race individuals from the social landscape. For most of our history, many mixed-race individuals of African American descent have attempted to acquire the socioeconomic benefits of being white by forming separate enclaves or “passing.” By the 1990s, however, interracial marriages became increasingly common, and multiracial individuals became increasingly political, demanding institutional changes that would recognize the reality of multiple racial backgrounds and challenging white racial privilege. More Than Black? regards the crumbling of the old racial order as an opportunity for substantially more than an improvement in U.S. race relations; it offers no less than a radical transformation of the nation’s racial consciousness and the practice of democracy. Part IV: Black No More or More than Black? Why Do We Consider Obama to Be Black? A historical look at the the persistence of the “one drop” rule. Editor’s Note: Historian and scholar Ronald Takaki uncovers the origins of the “one drop” rule that was key to defining race early in America’s history, and ponders whether we will ever move past it – even with a mixed race presidential candidate. Takaki, emeritus professor of Ethnic Studies at the University of California, Berkeley, is the author of A Different Mirror: A History of Multicultural America (updated edition to be published by Little, Brown in December). Barack Obama is the son of a white mother and a black father. In Latin America, he would be identified as “mulatto” or half white and half black, and in South Africa as “colored” or between white and black. Why are all African Americans, regardless of their mixed racial heritage, identified as black? What are the origins of the uniquely American “one drop” rule? The first 20 Africans were landed in Jamestown in 1619. Yet, the planter class did not rush to bring more laborers from Africa. The elite wanted to reproduce an English society in America. By 1670, only 5 percent of the Virginia population was African. Six years later, the planters abandoned their vision of a homogeneous society. During Bacon’s Rebellion, armed white and black laborers marched to Jamestown and burned it to the ground. After reinforcements of British troops had put down the insurrection, the planters turned to Africa as their primary source of labor: they wanted workers who could be enslaved and disarmed by law based on the color of their skin. The African population inclined upward to 40 percent. The planters also stigmatized the complexion of the African laborer. They had earlier passed a law which law provided that the child of a slave mother would inherit the status of the mother, regardless of the race of the father. Thus a child of a slave mother and a white father would be a slave. After Bacon’s Rebellion, the elite passed another law which enslaved the child of a white mother and a black father. Comments Off on Why Do We Consider Obama to Be Black? The “check all that apply” approach to race on the 2000 census has ignited a conceptual debate over the meaning and usefulness of racial categories. This debate is most intense over the category “black” because of the historically unique way that blackness has been defined. 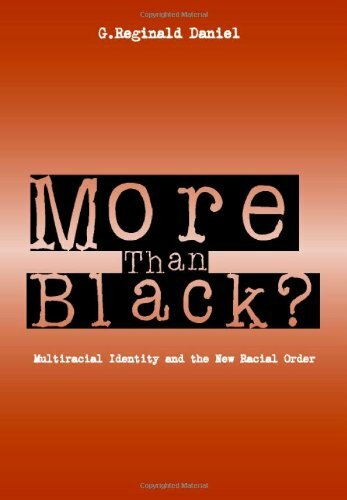 Though the lived reality of many people of color has changed over the past three decades, we question whether the construct black has mirrored these changes and if “black” remains a valid analytic or discursive unit today. While black racial group membership has historically been defined using the one-drop rule, we test the contemporary salience of this classification norm by examining racial identity construction among multiracial people. We find that that the one-drop rule has lost the power to determine racial identity, while the meaning of black is becoming increasingly multidimensional, varied, and contextually specific. Ultimately, we argue that social, cultural and economic changes in post-Civil Rights America necessitate a re-evaluation of the validity of black as social construct and re-assessment of its’ continued use in social science research. Historically, the principle of hypodescent specified that individuals with one Black and one White parent should be considered Black. Two experiments examined whether categorizations of racially ambiguous targets reflect this principle. Participants studied ambiguous target faces accompanied by profiles that either did or did not identify the targets as having multiracial backgrounds (biological, cultural, or both biological and cultural). Participants then completed a speeded dual categorization task requiring Black/not Black and White/ not White judgments (Experiments 1 and 2) and deliberate categorization tasks requiring participants to describe the races (Experiment 2) of target faces. When a target was known to have mixed-race ancestry, participants were more likely to rapidly categorize the target as Black (and not White); however, the same cues also increased deliberate categorizations of the targets as ‘‘multiracial.’’ These findings suggest that hypodescent still characterizes the automatic racial categorizations of many perceivers, although more complex racial identities may be acknowledged upon more thoughtful reflection. For more information, see Winthrop D. Jordan’s (Paul Spickard, ed.) “Historical Origins of the One-Drop Racial Rule in the United States,” in the Journal of Critical Mixed Race Studies (Volume 1, Issue 1, 2014). What does it mean to be of African descent while residing in Canada, where the hypodescent rule does not hold sway? Naomi Pabst reflects upon the complexity of life for people of color regarded as neither, nor. For me, as a historian of Brazil, North America’s “one-drop rule” has always seemed odd. No other society in this hemisphere has defined its racial types in such absolutist terms. David Hollinger, like many American historians before him, is clearly intrigued by this apparently unique “approach to the question of ethnoracial mixture.” How can we account for it? How could such a different racial classification have arisen in North America and not in any of the many other European colonial experiments in the New World? Hollinger cites three features that in combination allegedly made U.S. racial evolution different. The first is a regime that tolerated slavery and thereby produced a significant population of slave descent. The second is massive immigration that enriched American society. The third is survival of an Indian population, even if only in token numbers. But Hollinger examines the influence of these three factors on racial attitudes and behavior in the United States alone. If we add one other country, Brazil, to the picture, we find something rather startling. All three of Hollinger’s conditions also obtained in Brazil. Yet they did not produce the one-drop rule. Something else must have been at work. Many have argued that the increasing rate of intermarriage between racial minorities and Whites and resulting patterns of biracial identification will lead to the dissolution of the American racial hierarchy (e.g., Alba & Nee, 2003; Lee & Bean, 2004; 2007a; 2007b; Thornton, 2009). However, little empirical evidence exists on perceptions of new racial identities that diverge from older notions of race purity and the “one drop” rule. We tested whether a rule of hypodescent, whereby biracial targets are assigned the status of their subordinate parent group, would govern perceptions of Asian-White and Black-White targets. Participants morphed faces from Asian to White, Black to White, White to Asian, and White to Black. Consistent with a rule of hypodescent, a face needed to be lower in proportion minority to be considered minority than proportion White to be considered White. In addition, the threshold for being considered White was higher for Black-White biracials than for Asian-White biracials, a pattern consistent with the structure of the current racial hierarchy. Finally, an independent racial categorization task confirmed that hypodescent and the current racial hierarchy guide how biracial targets are perceived. Potential distal (e.g., fear of contagion) and proximate (e.g., racism) causes of these phenomena are discussed.